Parisa Simin-Mehr holds a BA in History and is a student of Persian Literature. 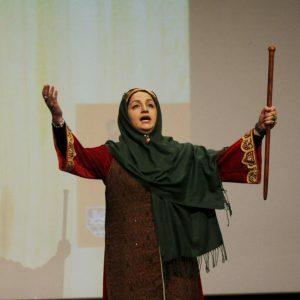 She started her work in theater in 1995 and has been working on the Shahnameh and professional storytelling (naqali) since 2000 under the mentorship of Mostafa Sa’idi, one of the last remaining old-school storytellers of Iran. She has performed several stories from the Shahnameh, Bustan, Khosrow and Shirin and other Persian Classics all over Iran as well as Italy and Germany.